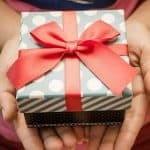 You should always show your partner how much you love and appreciate them all year round. It just so happens that Valentine’s day is a big holiday where everyone around the world participates in showing their love for their partner in the biggest ways possible—some bigger than others. 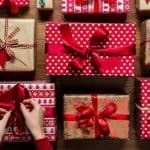 However, simple is the best way to go sometimes when you are trying to figure out the best gift you can surprise your partner with. 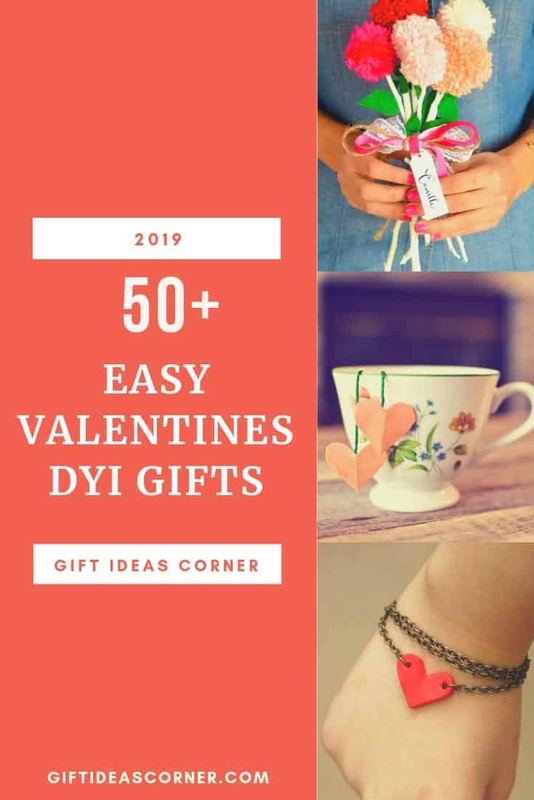 DIY gifts give you the opportunity to be creative and create gifts for your partner from your heart. It gives you the ability to be flexible and put your all into something they will cherish forever even if it is small. It’s always the thought that counts. Here are 50 DIY gifts you have at your fingertips to shower your partner with love. 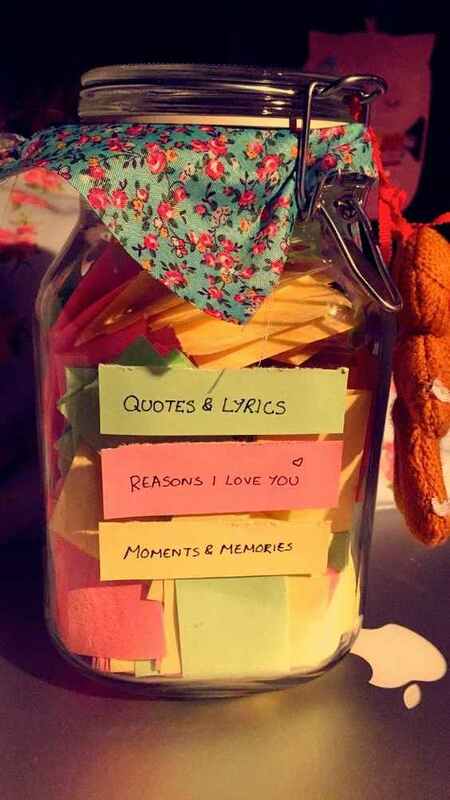 Now, this was made for a friend to cheer them up, but you can add your own little twist to create a quote jar of 365 song lyrics, quotes or memories that remind you of your significant other. 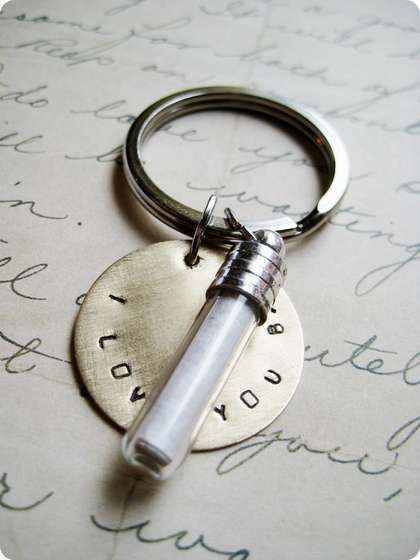 This is a perfect gift for your boyfriend or girlfriend to show them that you are always thinking of them. You can even lift them up if they are having a bad day! Take your favorite picture you have of you and your significant other posing together and create a ribbon photo they can hang on a hook to look at it all the time. 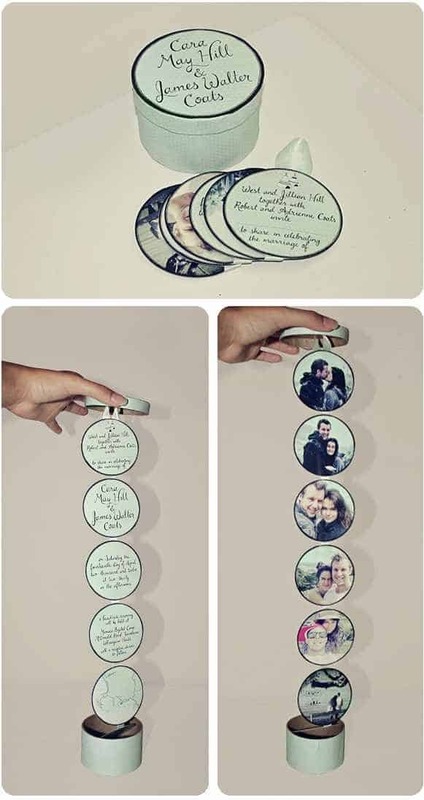 You can use the 7 circles that is needed for this DIY present and write things that you love about your partner or how happy you are that they are in your life. Maybe you’ve shown your love for your significant other with words all year round. Have you missed some things? You can create a box filled with 50 things you love about your partner and let them keep it locked away and safe. Anytime they need a little reminder they can come back to this box and read about your affection for them. This DIY valentine’s gift is great for a boyfriend or girlfriend trying to create something special. Do you know what her favorite things are? Why not fill up a basket and present her with all her favorite items? This DIY valentine’s day gift will work wonders for your girl. You can use the examples here to see what you can put in your basket. This is a great DIY valentine’s day gift for your girlfriend. Show her that you have a great memory. Nothing says you light up my world better than a DIY light bulb. 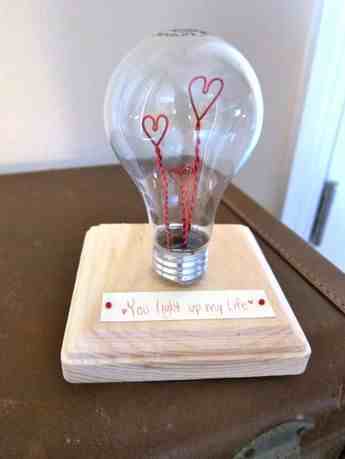 You can use this light bulb and display a message your significant other can find. This light bulb can be used as a decoration all year round, so she can find many uses for it. Wreaths aren’t used only as Christmas decorations. 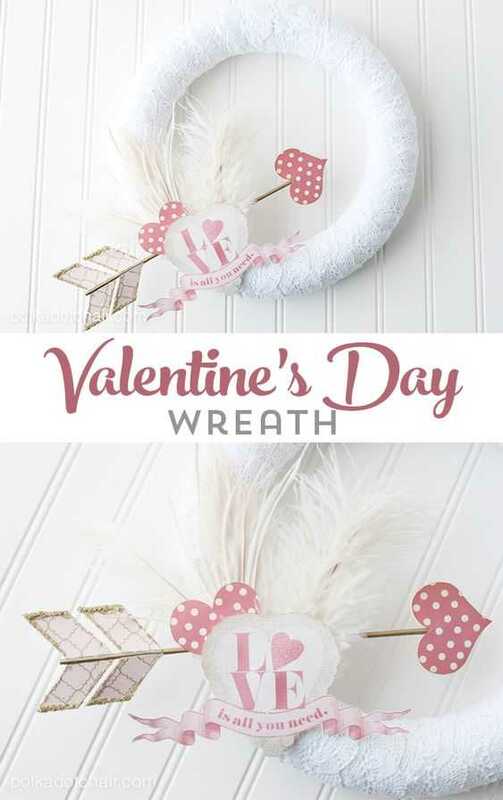 You can make a wreath just in time for Valentine’s Day to give to your partner. 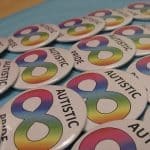 They can decorate their door, room, or wall with your gift. Circles are symbols of infinity. Show your significant other that your love for them is infinite with this wreath. Does your significant other have a sweet tooth? Can you name some of their favorite candies? First, you’ll need to find a gift bag or box to put all your candy choices inside and decorate it with cute and fun accessories. You can find all you need by following the DIY tutorial. February is cold, so make your significant other a blanket to keep them warm on Valentine’s Day. Maybe you’ve planned something special indoors and what to make them comfortable. This DIY blanket is great for the girl you’re trying to keep safe and warm with love. 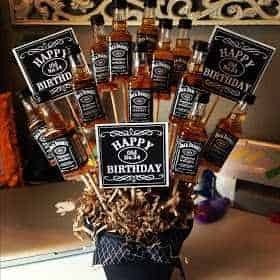 Instead of getting him a bouquet of flowers why not give him a bouquet of his favorite drink? You can DIY this man bouquet on any occasion, but nothing says love more on Valentine’s Day than giving your man his favorite drink in bulk. Of course, your name next to your significant other’s name is cute. 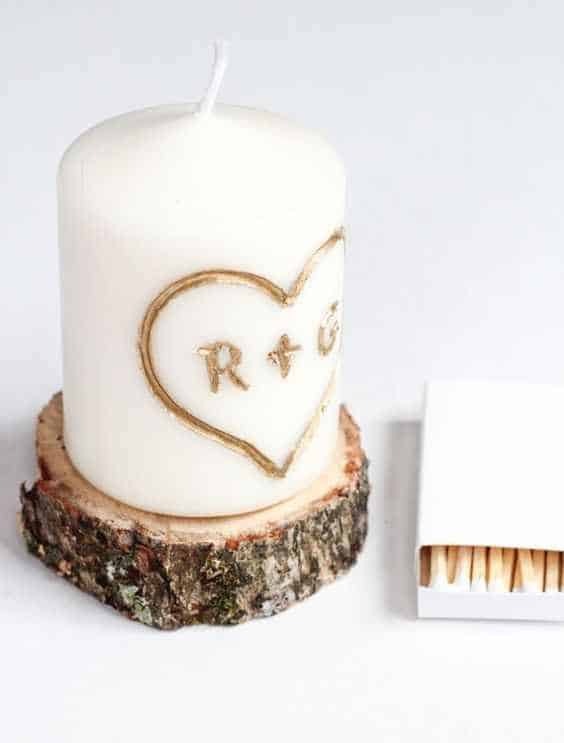 So why not put your initials on a candle in between a heart to symbolize your love. As your partner lights the candle they will remember you each time! Did you forget to kiss your partner goodbye in the morning as you rush out the house? 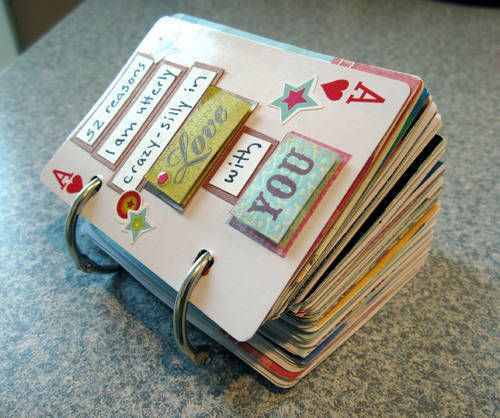 You can make this flip book, so they can keep all your kisses with them throughout the day! 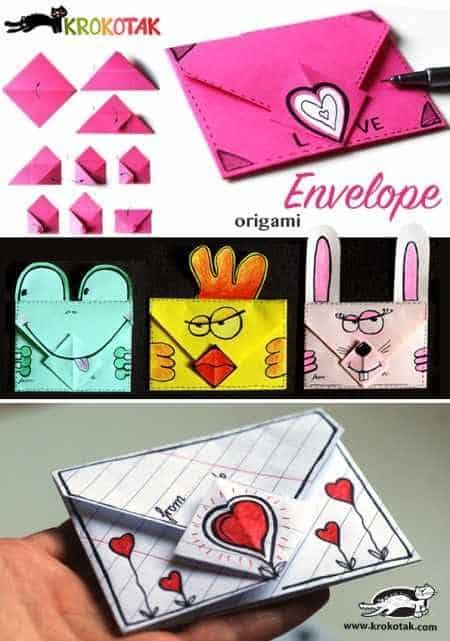 Instead of trying to find places to hide your love notes, so your significant other can find them, you can make an envelope pillow case cover where you can put your notes in. When they wake up in the morning, they will find it easily and read it. Give your significant other a great start to their Valentine’s Day! 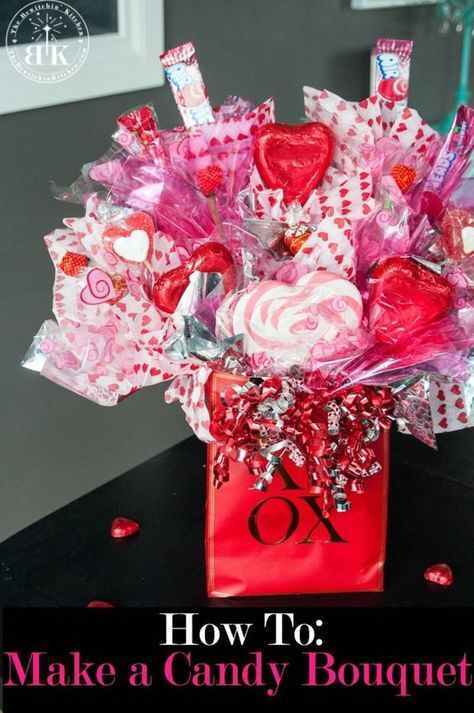 This is a perfect Valentine’s Day gift for your girlfriend or boyfriend. Do you love crocheting? Put your skills to work and create this bracelet for your partner to wear. This is originally a friendship bracelet, but your significant other can also be your best friend. Give your partner a wonderful Valentine’s Day with a bracelet filled with love and hard work. 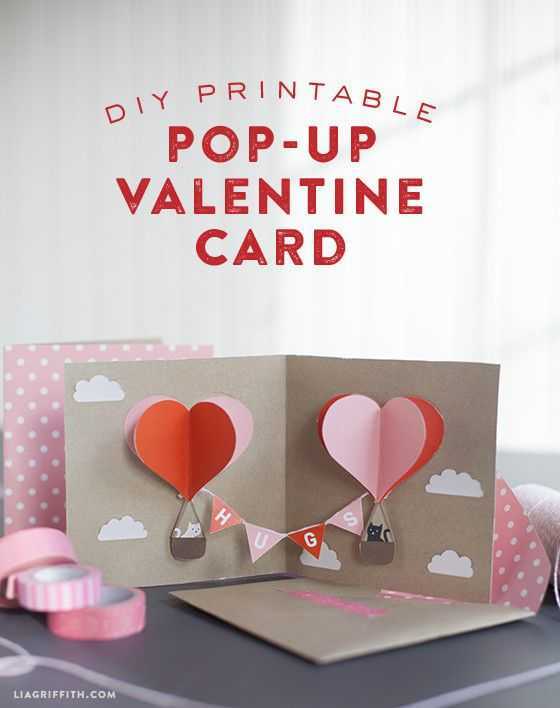 Make Valentine’s day fun with this homemade DIY gift. Instead of a scratch for a lottery ticket, you can make your significant other this scratch to reveal heart, so they can see your lovely messages. 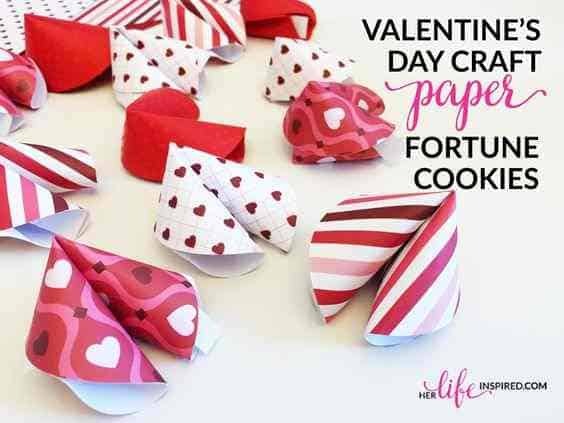 Why not be creative and make fortune cookies and hide your messages inside. 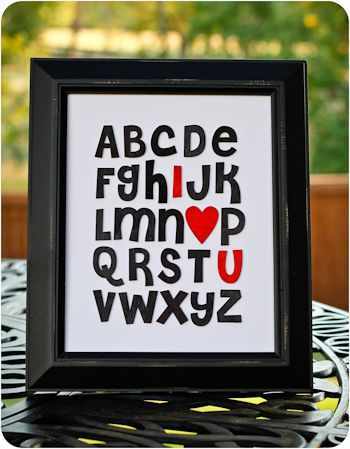 Write different kinds of messages for your significant other to look through while using your artsy skills. You don’t have to give a gift to your significant other to open on the same day. 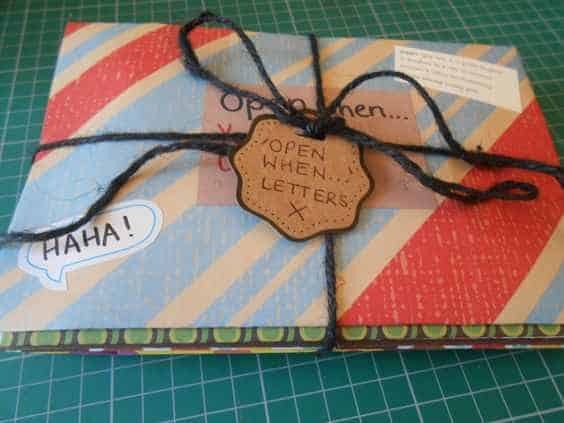 You can write “open when” letters, so your significant other can read on days they need a little pick-me-upper. This is a great DIY Valentine’s gift for the girl or guy in your life you want to show your love to. Instead of using bland envelopes, you can make your own and use as much colors and decorations as you like. 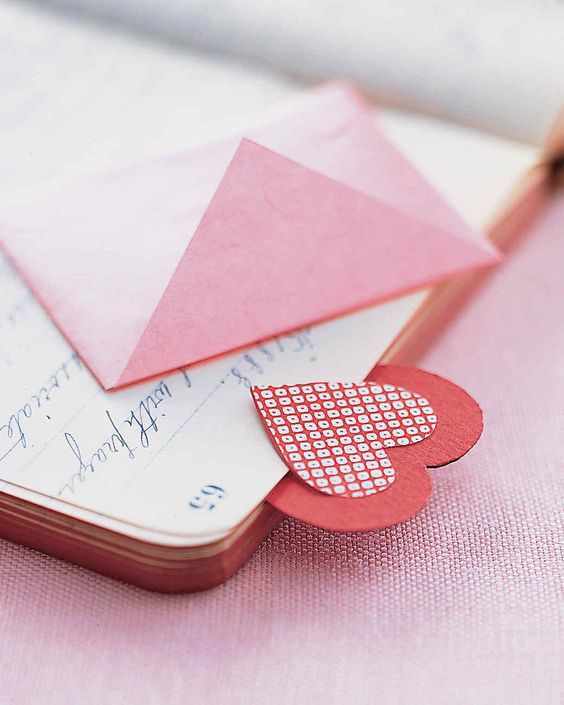 These envelopes will go nice with a love letter you want to give to your significant other on Valentine’s Day. 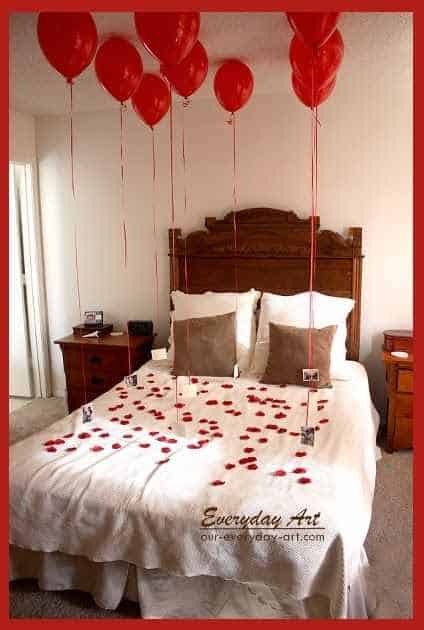 Decorate the bed with photos of you and your significant other with balloons all around to show all the great memories you’ve together. You guys can go down memory lane and reminisce about all your favorite times spent with one another. Did someone say beer? Does your man love beer? Your significant other does not have to be a huge drinker to be given this gift. 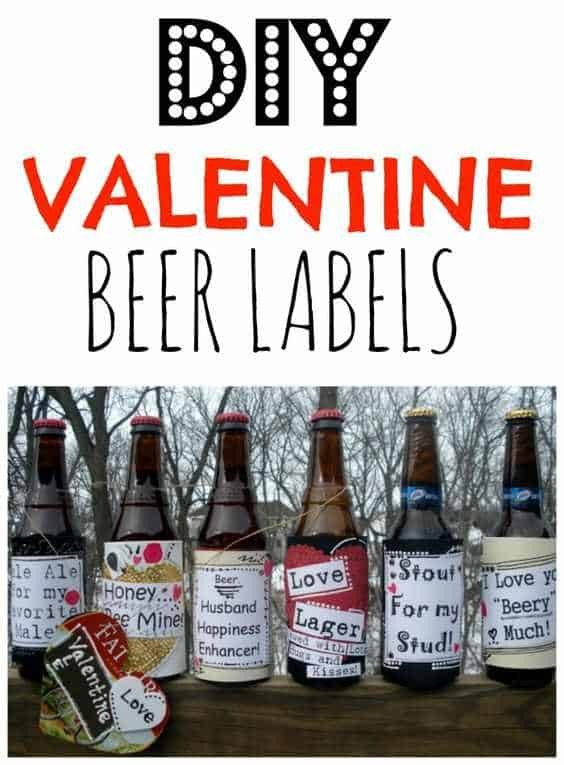 You can get multiple beer bottles and create labels to put on them that will make your man laugh and smile. This is a great Valentine’s gift for him to relax and drink his beer with you on his mind. The easiest thing you can do to tell your significant other that you love them is by using letters on a board to show them. Instead of saying it, you can illustrate it on a board and hang it up on a wall. You can customize the letter to look however you want them to. Have fun coloring and making cute things your significant other will love. Baking is one of the best gifts you can give to your significant other. 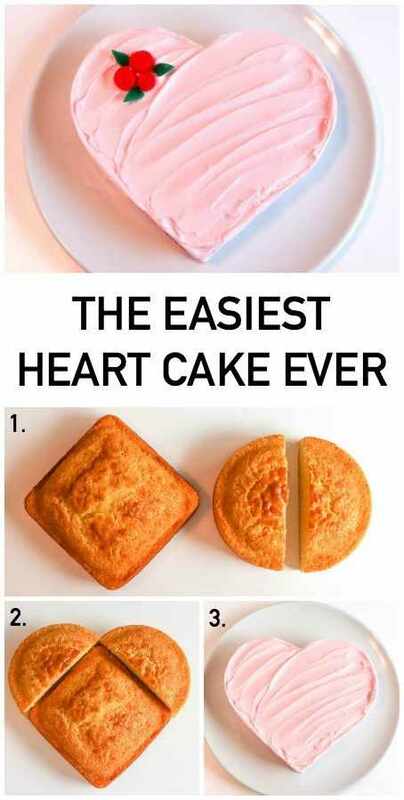 A heart-shaped cake is the way to go. Fill it up with your partner’s favorite flavored filling and lather it with their favorite flavored icing and you will have the perfect cake for Valentine’s Day! Why settle for a regular rectangle-shaped frame when you can make your own frame in the shape of a heart to put a favorite picture of you and your significant other in. It could be a picture he forgot about. Talk about a wonderful surprise! Do you always buy your significant other flowers for Valentine’s Day? It’s alright if you do. You can still by your girl flowers, but you don’t have to give it to her wrapped up in the plastic that it comes in. 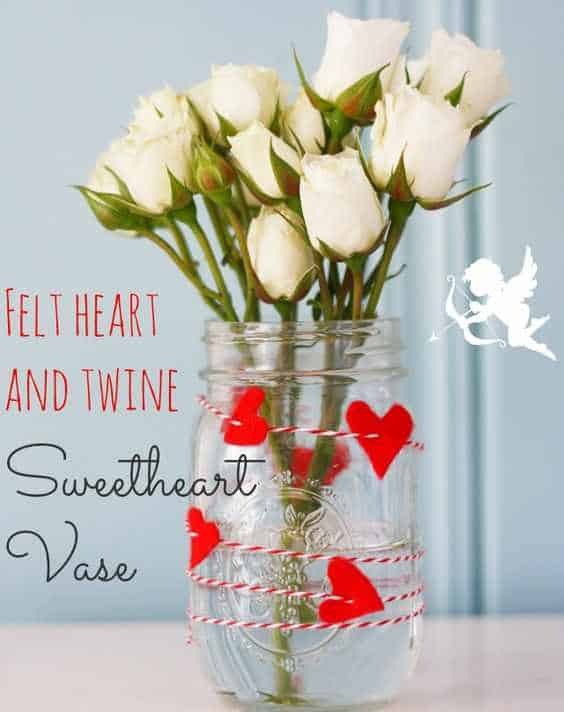 You can create your own vase with a mason jar and decorate it with felt hearts! This is a great Valentine’s Day gift for the girl that makes you want to do something different. Do your significant other love all kinds of plants? You can gift him or her with a succulent plant where you can also find a cute bucket to put it in. 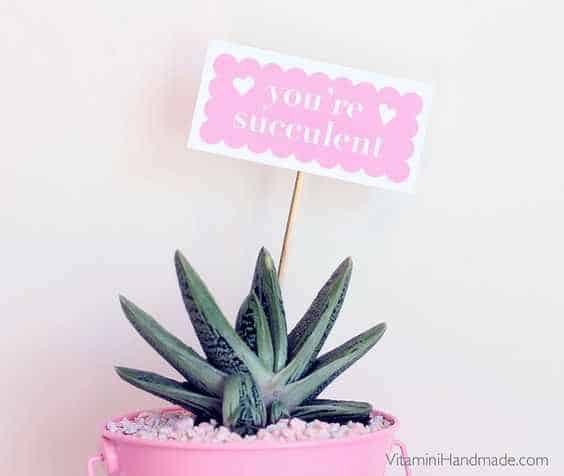 All you need is a succulent plant that they love and some Valentine’s plant tags which you can get from Vitamini Handmade. Are flowers overrated to you? 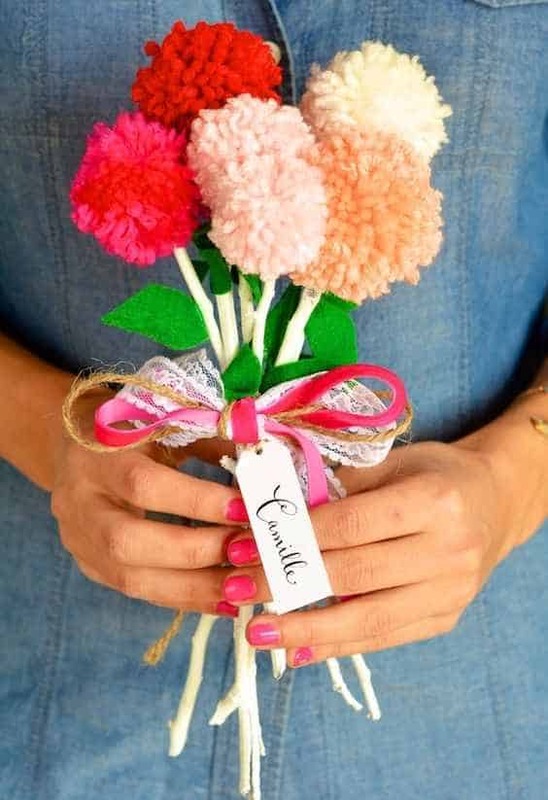 If you don’t want to get our significant other a bouquet of flowers for Valentine’s Day, you can opt for making your own out of pom poms! Handmade gifts say more than a store-bought gift. Show your sweetheart that she is one in a million! 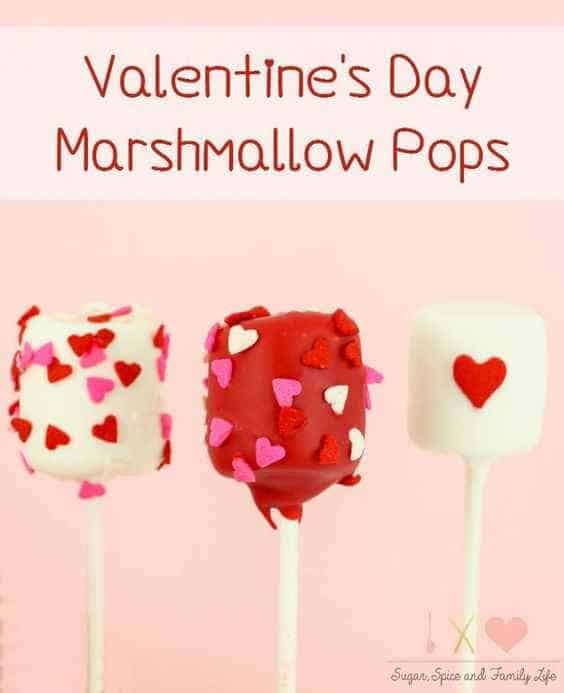 Tell your partner they are the sweetest with these marshmallow pops! 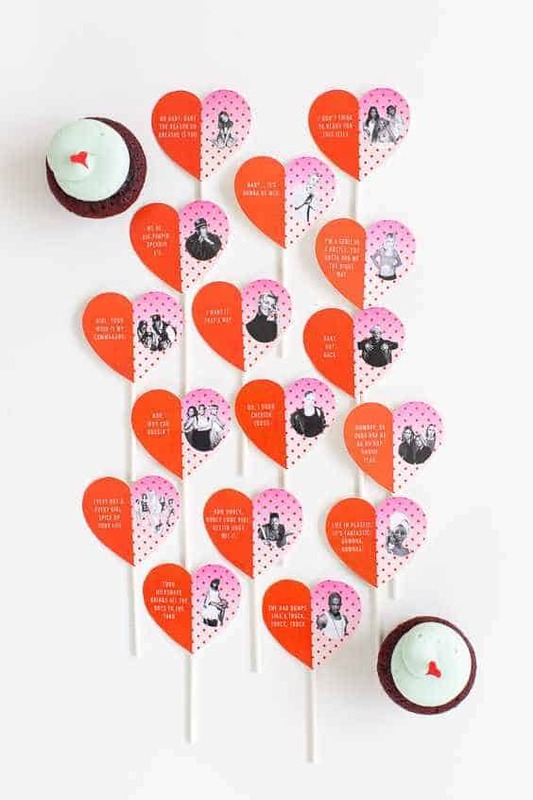 All you need is marshmallows, red and white melting wafers, lollipop sticks, and heart sprinkles. This sweet treat is the best to make on Valentine’s Day for your sweetheart. Valentine’s Day Honey Jar from Earnest Home Co. This honey jar is something that you can give to anyone on Valentine’s Day. 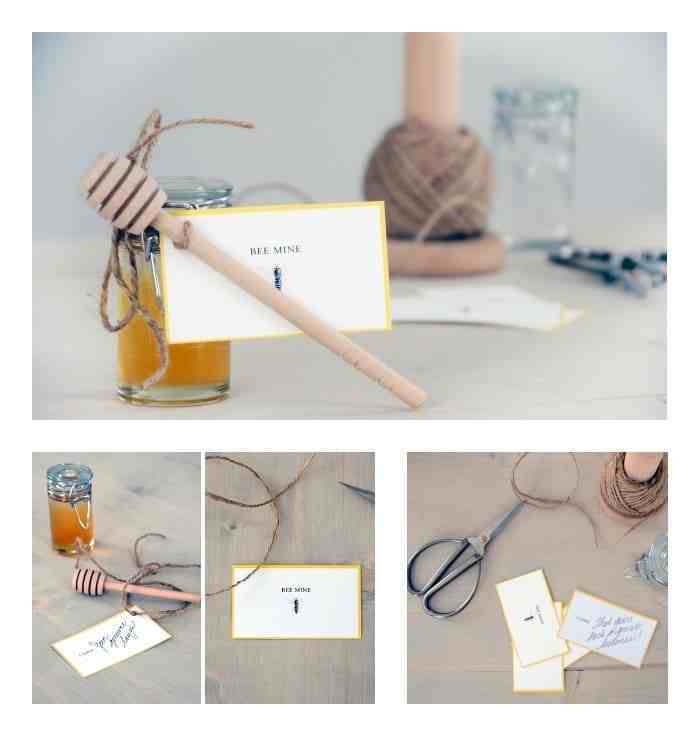 However, if your significant other loves honey, you can ask them to be your Valentine’s in the cutest way with a jar filled with honey and a “bee mine” card attached. What’s a better way to say you are my perfect match? Pretzels can be used in a lot of ways, some would say to make edible matches! Get some pretzel sticks, red candy melts, and a box of matches and start making these cute little pretzel matches for your significant other. Breakfast in bed is always a nice gesture for your significant other. 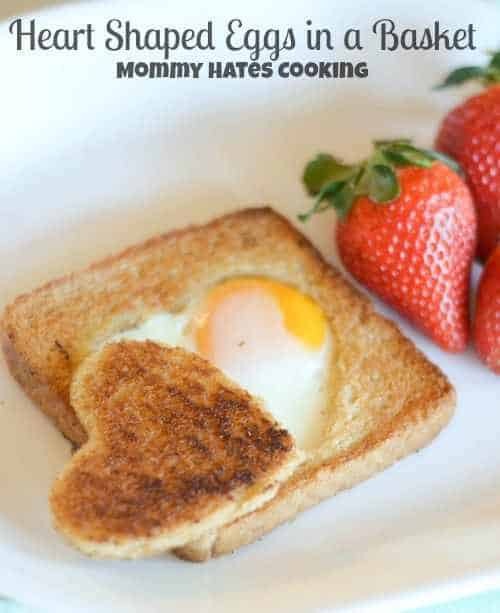 Egg in a basket is a great Valentine’s present for your partner as the bread is shaped in a heart. You do not have to be the best cook, but it is the thought that makes all the difference. Do you know your significant other’s favorite candies to eat? 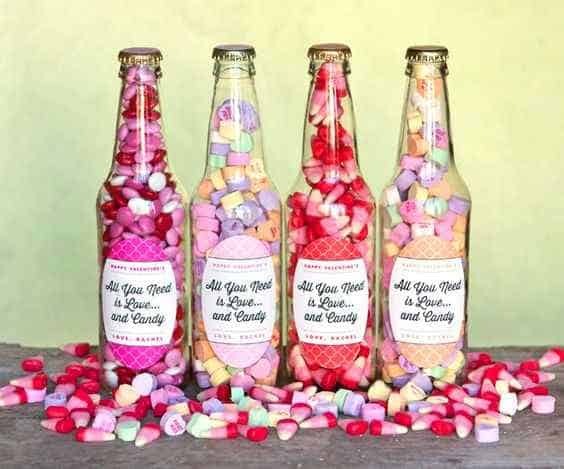 You can give them most if not all their favorite candies to snack on in a recycled soda bottle! Be creative, be different. 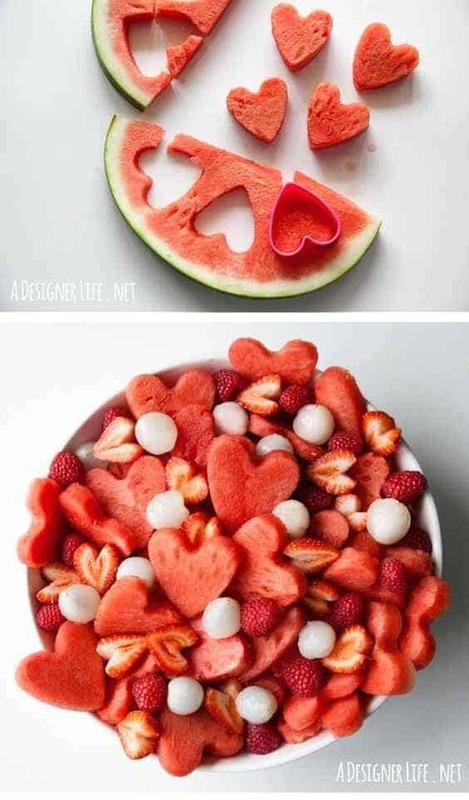 Cut up watermelons into small shaped hearts with strawberries and present it to your significant other. Food is one of those gifts where it’s impossible to say “no” to. If your partner is a lover of watermelon’s, then you can’t go wrong with this fruit salad. 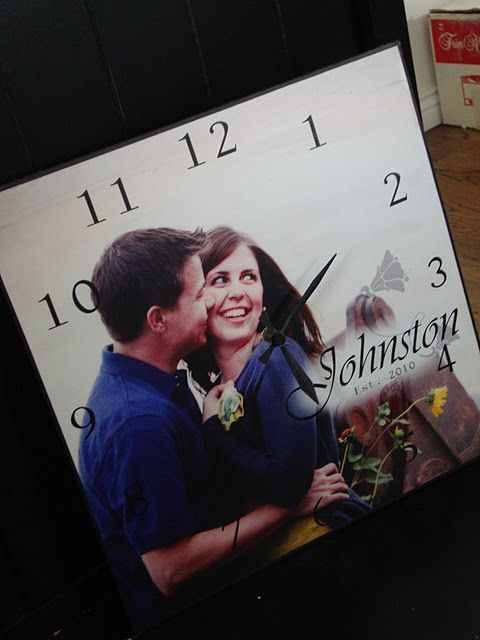 Create a clock out of a photo of you and your significant other smiling into the camera. Time shows how fat things go by and with this clock, whatever picture you choose, your significant other can see how long you guys have been together with a beautiful memory to represent your time together. Sharing and remembering the memories that you and your significant other create together is a great gift you can give to them on this Valentine’s Day. 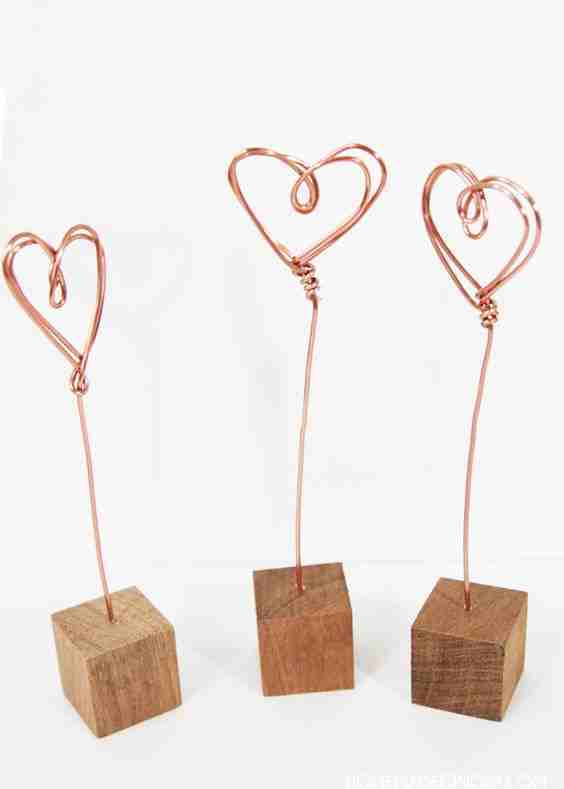 Use the DIY to make copper wire photo holders to place all the picture you want your partner to see. Now your significant other can keep you in their bag, back pocket, or wherever you go. Want to create something they can have with them all the time? They will be able to look at the message you put inside of it and smile every time. Your kisses do not have to be physical all the time. 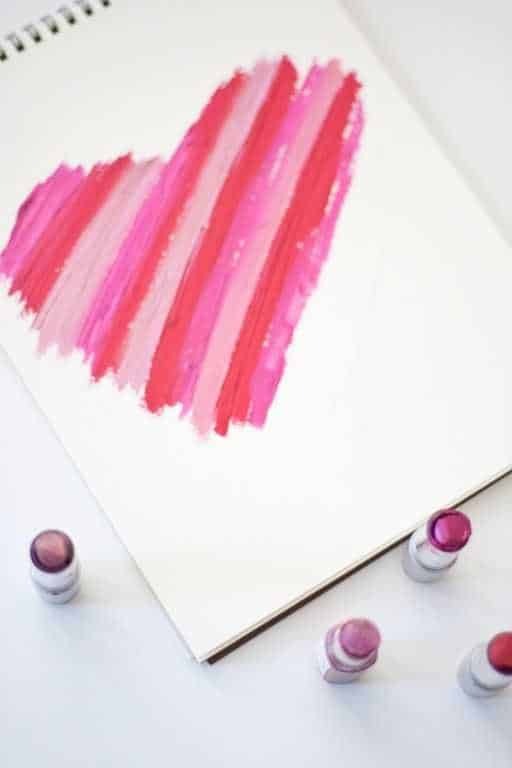 You can use lipstick marks to make your kisses permanent and let your significant other know that you will always have kisses for them when they walk through the door or every time you see them. Bake cupcakes with your significant other’s favorite flavors and top it with song lyrics that reminds you of them. 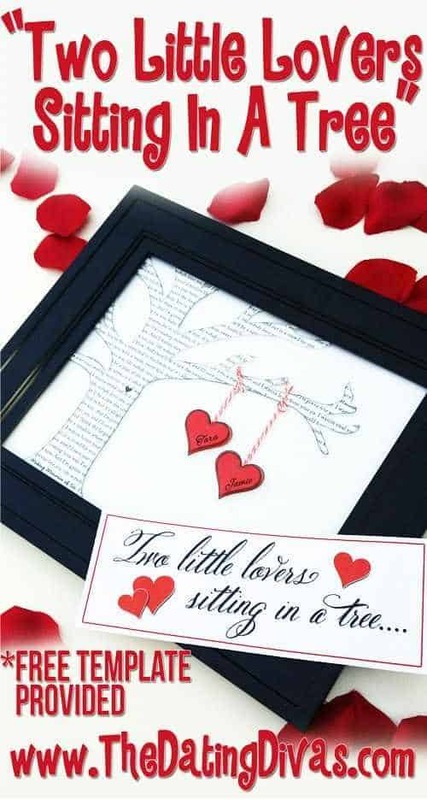 This is a great DIY Valentine’s gift for your partner showing them that there are so many things that reminds you of them. 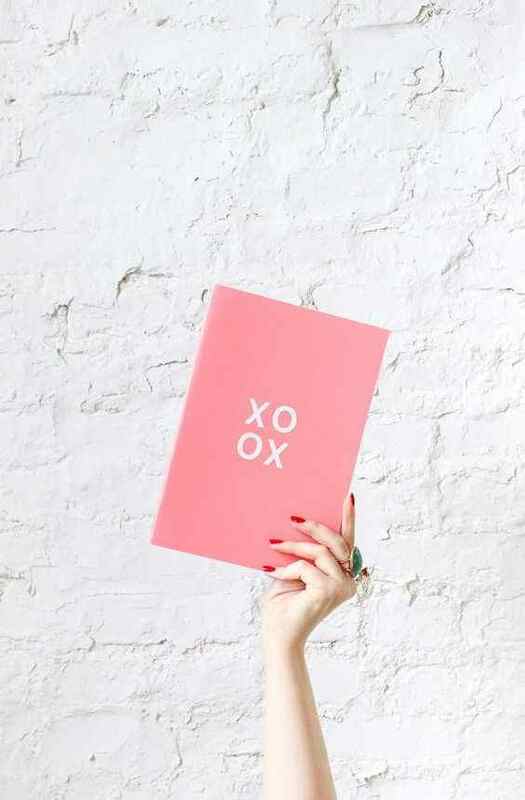 Maybe doing a DIY of Valentine’s Day notebooks for your significant other is something your interested in. You can say whatever you want on the front cover and write something for your significant other. This is a great Valentine’s Day gift for your girlfriend or boyfriend to show them that you have so much to say about them that you can write a book and your love is infinite. 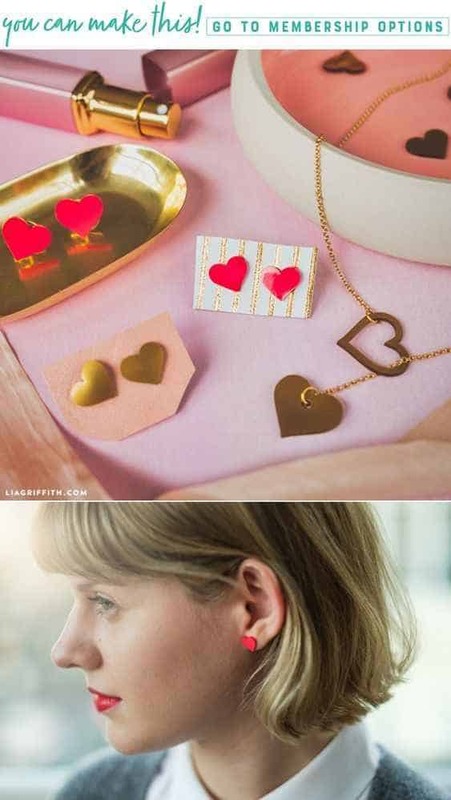 Everyone likes jewelry, so why not use that to your advantage and make your significant other this heart necklace for your partner. She can wear it everywhere with anything and you will make her Valentine’s Day special with this special gift from the heart. 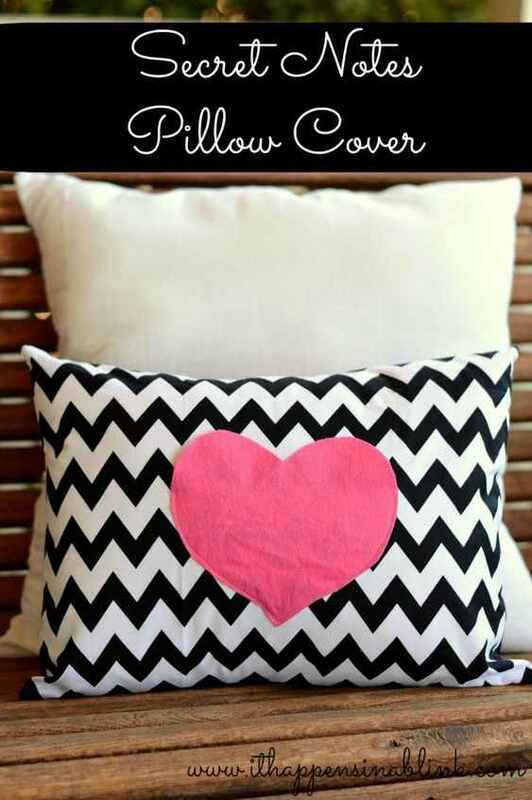 Here’s another pillow you can make for your significant other. 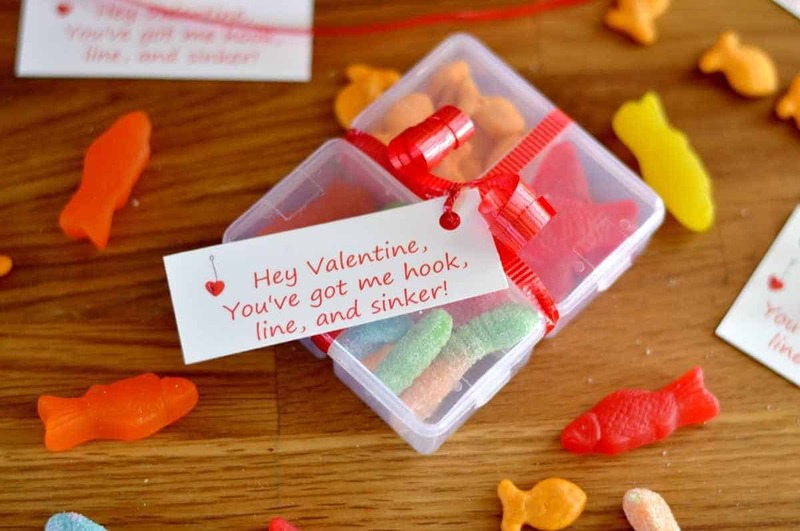 If you are a sewer, this is another idea you can to give your partner a great Valentine’s day gift. 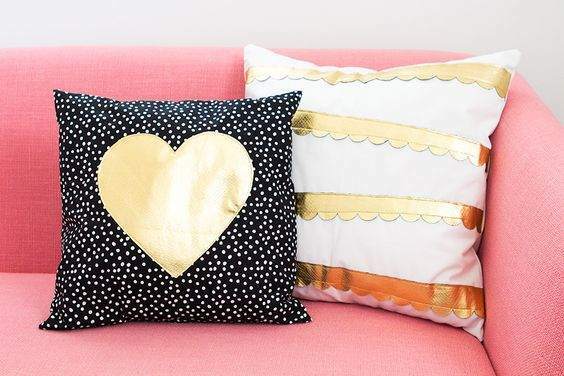 Use your skills and put it to work as you create a pillow your partner will love. You can decorate the wall of your significant other’s wall with this DIY wall décor or if you guys share a home together this will be even better. There’s a free template to follow by The Dating Divas if you want to try it. Why settle for a boring Valentine’s day card when you can make one yourself that pops up with cute little pictures of your own choice. This is a cute way to make something silly and lovely for your partner. Get unique and add something personal to your gift for Valentine’s day to your significant other by gifting them with this light up mason jar. 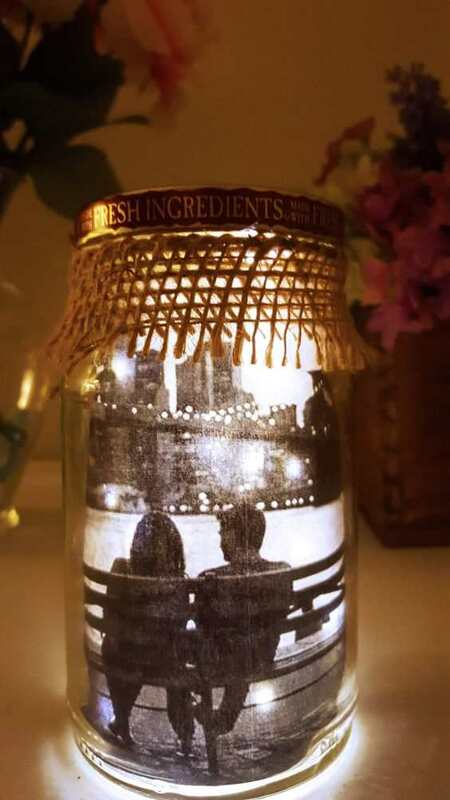 Find one of your favorite pictures of you and your significant other together and watch it light up in the jar. 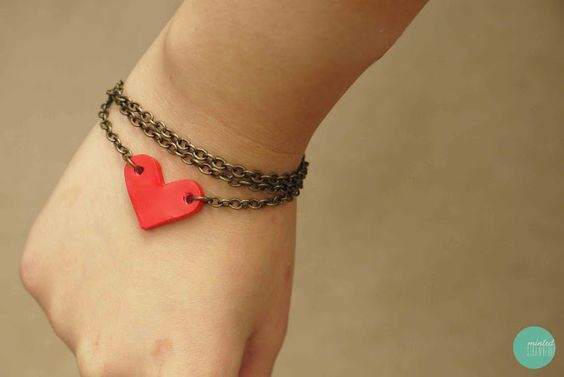 Another jewelry gift you can give to your significant other is a heart bracelet. You can make this with just a rubber spacer; very convenient and creative. Maybe you are looking for something big to make. Well this may be the DIY gift you want to try and create. This is easy to make and bright. You can’t go wrong with hugs and kisses this Valentine’s Day! Does your significant other love to read? This can be a great homemade Valentine’s Gift for your partner to use while they read. 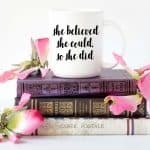 This DIY gift will keep them from losing the page of a book they were on and it will be hard for them to not think about you every time they read. 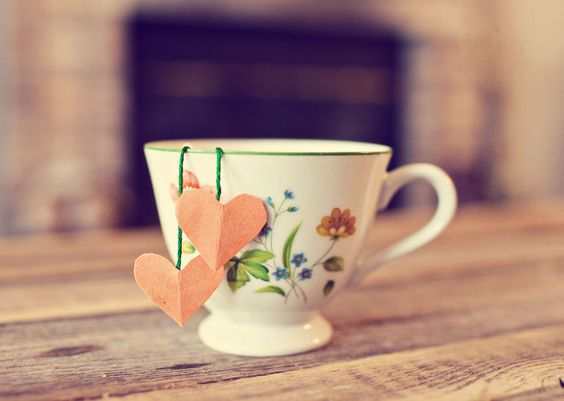 If you know your significant other is a tea enthusiast, then why not gift them with this DIY loose leaf tea. Get their favorite loose tea and create your own tags for them. A heart will do the trick! 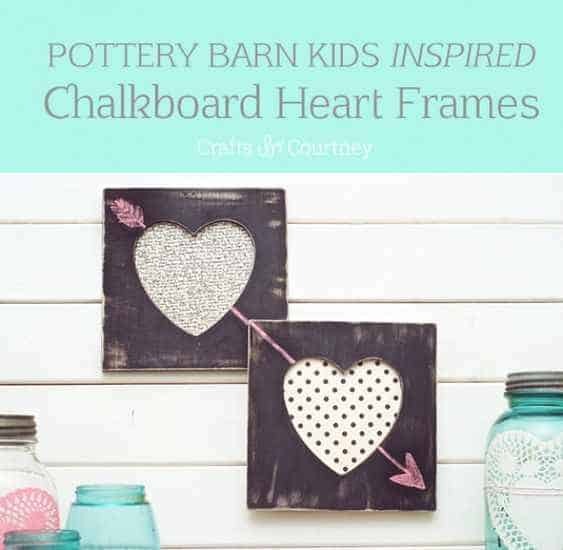 Oh look, here’s another DIY that consist of hearts and chalk! 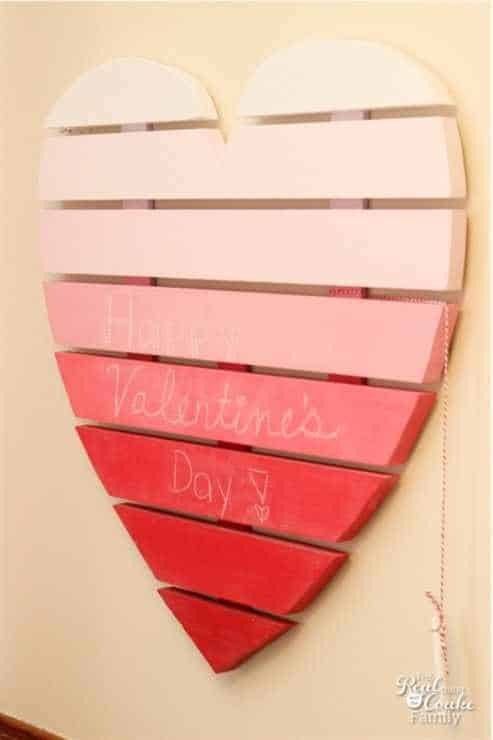 You can write whatever you like on this heart palette chalk board and display on the wall in your home. Purchase some wood boards and start creating! There is so much to say to the person you love and what better way to do it with a creative twist. All you need is a deck of cards and all the words you want to say! Valentine’s Day falls in a month where the weather is cold, February. 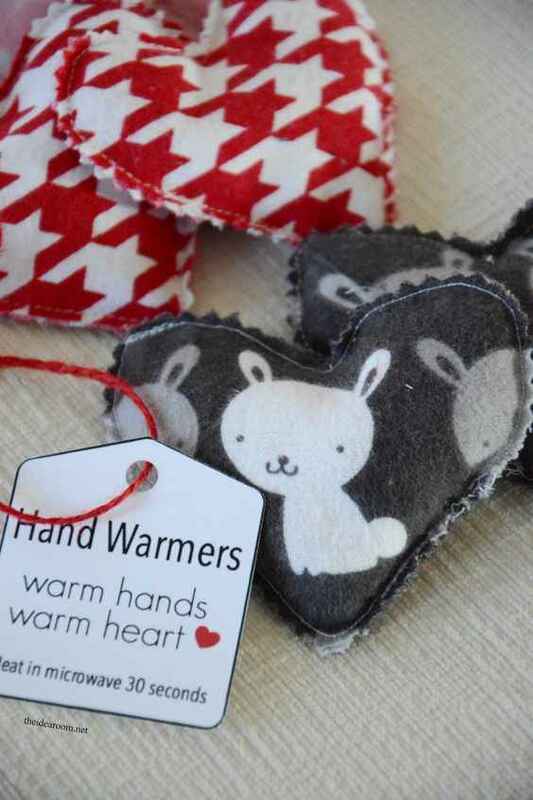 Why not gift your significant other some hand warmers for when outside is freezing cold? All you need is some cute fabric, needle and thread. As simple as they may sound, chocolate covered strawberries are the best! Melt some chocolate, dip strawberries in it, and freeze it. You can serve it to your significant other for dessert and feed it to them one by one! Valentine’s Day is a day to show your love to your loved ones, especially your significant others. However, make sure you shower them with love all year-round because one day isn’t enough! 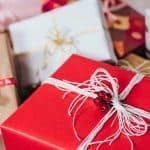 If you had trouble finding out the perfect gift for your partner that is sentimental and comes from the heart, hopefully, any one of the 50 DIY gifts gave you some inspiration!